In 2004 Neill Blomkamp made a short film called Tetra Vaal, about a weapons corporation who make police robots. It was smart, innovative and it looked incredible. This short gave birth to the idea of Chappie, a robot designed to be law enforcement whose maker, Deon Wilson (Dev Patel) discovers a way to give Chappie artificial intelligence. 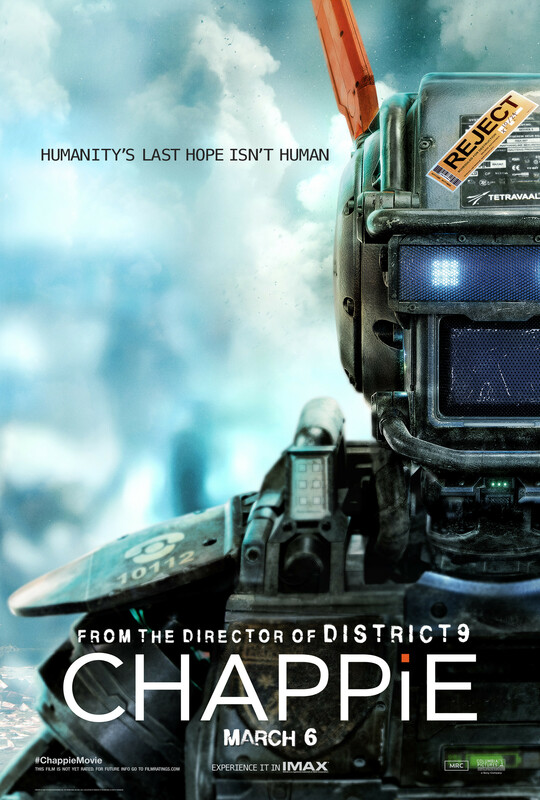 And so, Chappie is born, learning very quickly under the guidance/parenting of Wilson, Ninja and Yo-landi Visser (the South African hip hop outfit, Die Antwoord) and Yankie (Jose Pablo Cantillo from The Walking Dead), Chappie grows into an amalgam of moral sense and street-smarts. Wilson works for the company Tetra Vaal, which is a weapons manufacturer run by Michelle Bradley (Sigourney Weaver) as does Vincent Moore (Hugh Jackman sporting a haircut from the bogan barber). Wilson is an engineer at heart and wants to advance his research with the A.I. but is stopped by Bradley as she feels it is not worth the companies money. He goes ahead anyway downloading the consciousness into a robot headed for the scrap heap and fun ensues. I was looking forward to this film a lot, having avoided Elysium due to poor reviews, I was excited about the prospect of Blomkamp revisiting his original story. It is a fun film that isn’t amazing but manages to entertain. The problem is the script that is just not tight enough. There are holes and leaps that defy logic, and I’m not talking about putting consciousness into a machine, that, I can suspend my disbelief for, it’s more about the composition of the story-telling. It doesn’t quite gel. Jackman is uninspiring, not terrible, he can act, maybe he’s miscast or more likely, his role is not fleshed out enough, a stereotypical villain role. The effects, like in District 9 are great, seeing Chappie go to work is a joy. It is strange that Ninja and Yo-landi are ostensibly playing the characters they utilize in Die Antwoord and using their own names, an unnecessary choice on behalf of Blomkamp. It was fun seeing them do their thing, though. The problem with Blomkamp’s work to date is the scriptage. D9 was so different that any qualms were quashed by the journey but here it feels that he has work to do. There is potential, masses of it, but it falls just a tad short. Worth a watch if you are into sci-fi, robots and big concepts.